When the weather is warm and the fish are biting, there is no better place to be than the Sunshine Coast. Taking the family fishing is a great way to spend the weekend relaxing and enjoying not only nature, but each other’s company as well. Here are four of the top locations to go fishing with the family, and the best part is, you don’t even need a boat! This dam was established in 1973 spanning Addlington Creek, and is located 5km south-east of Mooloolah. The dam is home to native and stocked fish, including yellowbelly, Mary River cod, saratoga, Australian bass, tandans and spangled perch. There have been reports of a few illegally introduced Barramundi caught in the dam as well. With a range of other activities on offer, such as kayaking, canoeing, mountain bike riding, sailing and high ropes courses, there’s something for everyone to enjoy at Ewen Maddock Dam. Nothing beats casting a line into the surf while standing on the endless stretches of golden beaches that the Sunshine Coast is famous for. 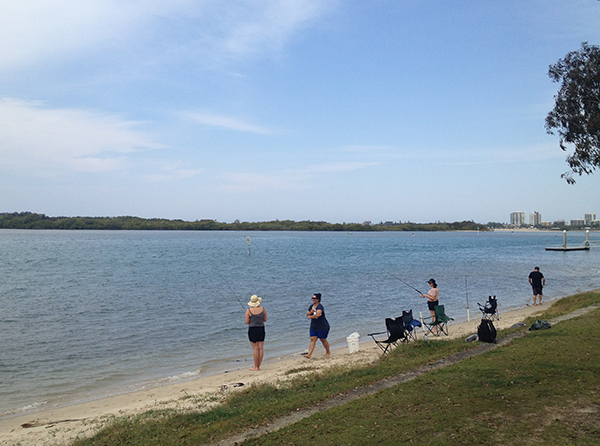 Thanks to a number of gutter formations, the beach between Caloundra and Double Island Point makes an ideal place to catch a range of fresh fish with the family. Expect to see tailor during the winter months, and abundant whiting, dart and flathead in summer. There are also some mulloway, jew, and yellow-fin bream that can be caught from the beaches. Why not pack a picnic and make a day of your family fishing trip to the beach. Teewah and Rainbow beaches are renowned for some great fishing, but are only accessible by 4WD. This is perfect for those seeking a little more adventure from their beach fishing experience. The Maroochy River is a very large yet shallow system which is peppered with deep holes perfect for some spirited on-shore fishing. The river is home to a wide variety of fish including flathead, cod, mulloway, sand whiting, tailor, bass, mangrove jack and several types of trevally. The best land based fishing is from the northern and southern shores of the river mouth. For a picture perfect end to the day, make you stay to watch the spectacular sunset reflected in the river’s glimmering waters. This is often heralded as one of Queensland’s most established lakes and is located 50km south of Gympie. A fly fisherman’s delight, both bass and saratoga are plentiful and ready to bite. You can also find Mary River cod, Australian bass and a combination of gold and silver perch at the dam. Renown for being aggressive biters, this is a great place to get the family involved, as they are highly likely to have a catch or two by the end of the day! Barbeques and camping are welcome, so why not take the weekend to enjoy everything Borumba Dam has to offer. Exploring the Coast’s best fishing spots is a perfect way to unwind and spend quality time with the whole family. 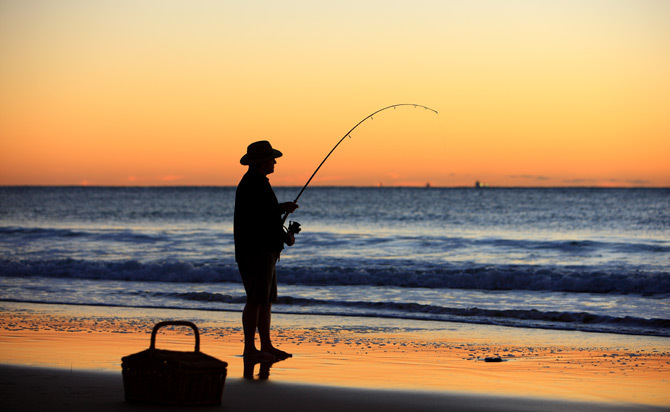 With such plentiful fish and picturesque locations, these are some of the top spots for on-shore fishing in the stunning Sunshine Coast region.